Put me, a pot or two of ink and a screen in the same room and you’re asking for trouble. I am the very definition of Screenprinting Disaster. There’s mess everywhere and there’s a great, goofy, beaming, smile on my dial. That worn out t-shirt up there is evidence of the screenprinting disaster zone. It’s old and unglamourous and the Mr’s work t-shirt from ancient times. It’s also the one I wore with great purpose when I was busy birthing the third kid. In between all the huffery and puffery I’d look down at the Love Your Work. Except from where I was standing/climbing walls/yelling at lung tops, it was reading an upside down Work Your Love. I dig that scuzzy t-shirt. 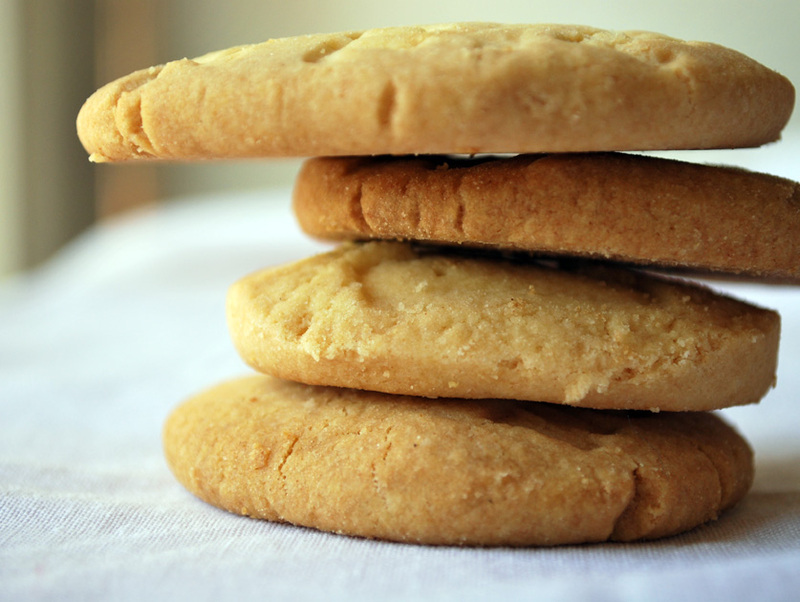 In other highly creative output news the Mr and I have been baking cookies. I shall say nothing more in the interests of cloak and dagger-ish-ness, except for the bit about them being seriously scrummy as a tea accoutrement. In yet more secret-squirrel-because-it-may-yet-fall-in-a-heap news, my eldest and me are plotting some collaborative mischief, concocted over teeth brushing and brainstormed through toothpaste foam this morning. I am ITCHING to haul that kid out of school early and GET CRACKING. And it’ll be eggs on toast for dinner tonight. oh it looks so good! I know what you mean about pulling a kid out of school - mine isn't even there yet and I feel like doing it - should i be worried? He is just such a good offsider (most of the time) that I kinda got used to him! School holidays be damned - I made him - he's mine! All that glorious red, red, red! 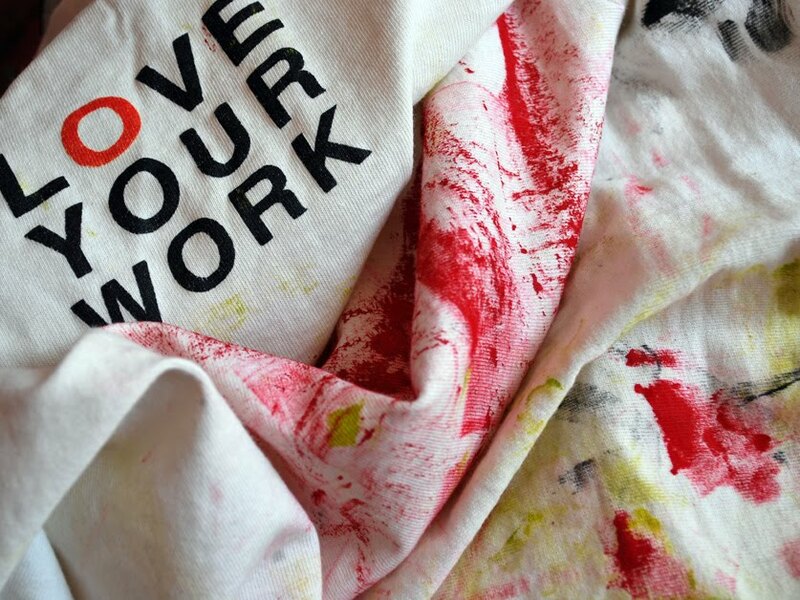 Work your love - that's excellent. A phrase waiting for a project. Get printing, messy brilliant one! Such great redness, one of my favorites! 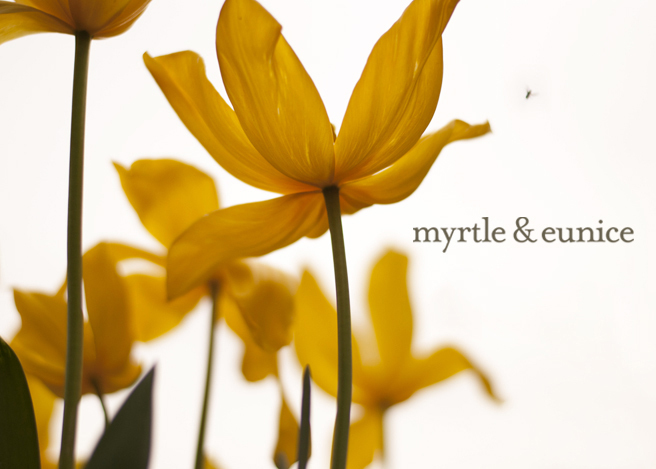 Isn't it fun to be so excited to start something that you want to skip school collectively? Oooh looks lovely with all that red mess. And the tee story is just adorable...I think me and the hubs need to bake something over his 4 day next week. Looks like your collaboration turned out super yummy! We had (thanks to the Bloke) eggs on roti, with leftover dahl, tonight. I highly recommend it as a way of diversifying the eggs on toast diet. Oh if only my children would eat eggs on toast as a meal, not a snack, "where is the meat mum, what no vegetables??" They are hollow & can never be filled up. Our kid had 2-minute noodles and frozen veggies. We had bread rolls with smoked salmon. Even the kid said, "But that's not a proper dinner!!". Eggs on toast is a proper dinner. And that's the best t-shirt ever. Eggs on toast is a great dinner. I'm also a fan of just baked beans in a bowl, not for me though obvs. Your creativity, as ever, is fabulous. Keep up the good work, grub. You are so talented that if I didn't like you so much I ...wouldn't. Can I have a biscuit? I bet I could out mess you! I truly believe I am the messiest printer in the world! 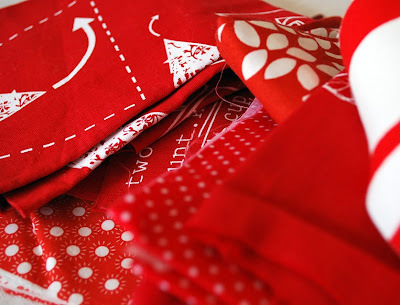 I love the picture of the red fabric you posted...what oh what are you going to make! whatever it is, I know the feeling of being so excited after cooking up a great idea in your head that you just can't wait to get at it! Looking forward to it! P.S. That is so nice that your hubby baked cookies with you. I don't think my husband has ever baked one thing with me! We have cooked dinner together...but never baked...that would be so sweet! 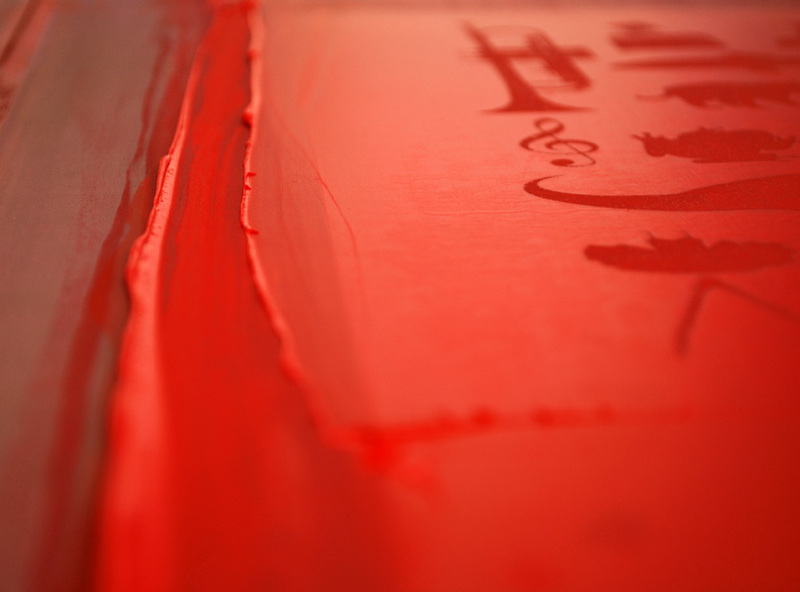 I swear, one of these days I'm going to learn how to do real screen printing, I have a deep longing that wont go away. I love the story of the shirt and I am excited for your collaboration with the eldest! sounds like alot of fun at your place and exciting secrets are always so much fun. you keep us hanging don't you. Eggs on toast for tea is always a sign of great creative action! On another note, I'm so sorry to hear of your friend's loss. So unbelievably sad. Thank you for writing the way you do Tania - I am reminded to hug the cheeky monsters of mine just that bit tighter tonight and ignore the latest wall scribblings. Toothpaste , biscuits and eggs on toast . You HAVE to be in the next Masterchef .